My 1998 2 door tracker (1.6) was sitting about a week. I went to start it and it sputtered for about 1-2 seconds and has even tried to fire since. Consistent cranking, fast since I have a new HD battery for my winch. Fuel pump runs, but when I pull a lead off the distributor while cranking I se no spark (sorry I don’t have a spark tester will buy today). I then swapped out the fuse box for a good known unit, same thing about 7 volts on the FI fuse with KEY ON. No noticable corrosion on fuse box or connectors that plug into it. Although the plug underneath towards the front (my base model only has 2 plugs in fuse box) was hard to pull out. 98 G16b no spark (with no spark the ECU sees that and cuts fuel , to prevent crash and burn as seen TV and real. first learn to measure volts on both sides of fuse. and end the guessing whats up. see? both sides are 12? if both sides are 7v that means the main box fuse is damaged in soom way. know that most TRACK/Kick/Vitara's driven in the salt belt all fail under the front main box. all do, and the cure is obvious. 96 -98 all have a new box those year, with FI fuse moved, see? to there. to work the box remove the battery neg lug or risk fire, and burns, when you short things there, the feed there is 500 amps, so do not short parts in that box ever. the output of 80 feeds all fuses in this box so of FI is 7v the problem is here. (fuse good, ) if FI is blown that 7v is back feed voltages. we really need to know if FI is blown, 0ohms is good, infinity (fuse in hand) is blow,. 12vdc one side and 7 other side , is fuse blow, for sure, the 7v is back feeding currents, from other paths, many.... ill skip why just take it as truth. well here is my page on that, cover like 5 ways to find it, all ways from Sunday. yes, then find the short next using simple isolation tactics. What do you mean both sides? I stuck the Probes in where the fuse goes. Now, this is important step in my trouble shooting. I took a fuse box with all the fuses out of a running and driving 1997 2 door sidekick and I still get ~7 volts on the FI fuse and no start. What do I check next now that both my fuse box and fuse is good? You’ll have to excuse how much of a beginner I am at electrical measurments. So in order to find what the voltage on the FI fuse what do I do? So got an update, apparently my electrical trouble shooting was a little.... off. Turns out that isn’t my problem. I swapped in a distributor from a 97, but I’m going to need to retime it. But there is good news!! I have spark now since it’s rumbles and puff. Very close to starting but can’t quite do it. That’s better than just endless cranking. it must be timed, cant be just thrown in. 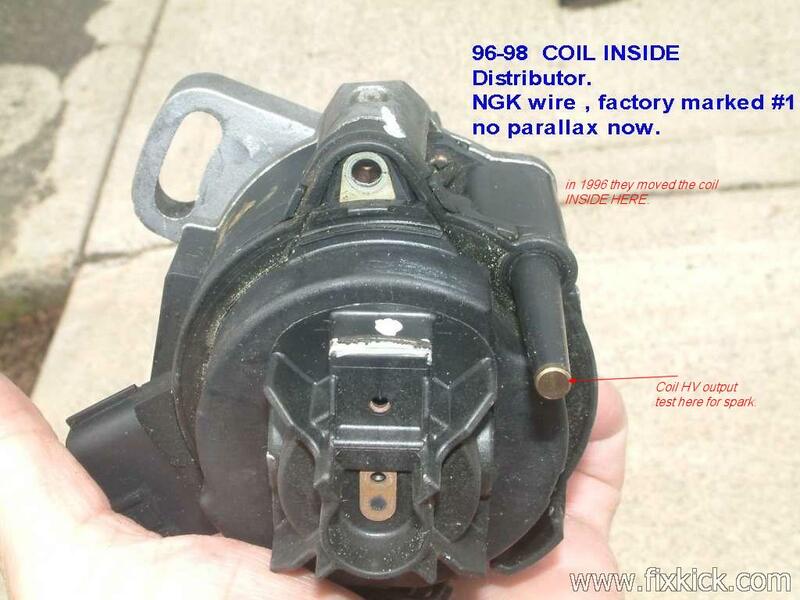 the coil is inside the distributor. even a bad rotor shorted to the shaft , a cheap part bad, can hid the fact the coil works perfect 96-98 years. i jumped all over 7vdc, not spark, as power is first, always first. my guess is your meter was not grounded right. or you did not probe the FI fuse correctly and not both ends. as must be down to get CAUSE , known. removing the old distributor first makes that super hard to do , done wrong like that ,not, but see below. but that is history now, gone, now you need to learn how to tell #1 from #4 firing TDC. turn the front pulley to 0 tdc mark (means 1 or 4 firing now) (find a rubber hose, that is say 12 to 18 "inches long, that fits in spark well spark plug out. so turn the crank pulley 1 full 360deg turn CW, now , cheeks test passes for #1. firing, now you are ready for DIZZY drop. and make the rotor points to #1 cap spark wire. (mark the dizzy rim for #1 location, cap on , the take the cap off. see my drawings for #1 true locations. Gotcha, I’m so sad I rushed and pulled the dizzy without noting where it eas pointin!!! So stupid of me. When I find TDC firing on #1 I turn the rotor to look like this? put the cap back back on.